GLIDE Co-Executive Directors Kristen G. Yamamoto and Rita Shimmin share their reflections from an awe-inspiring holiday experience! 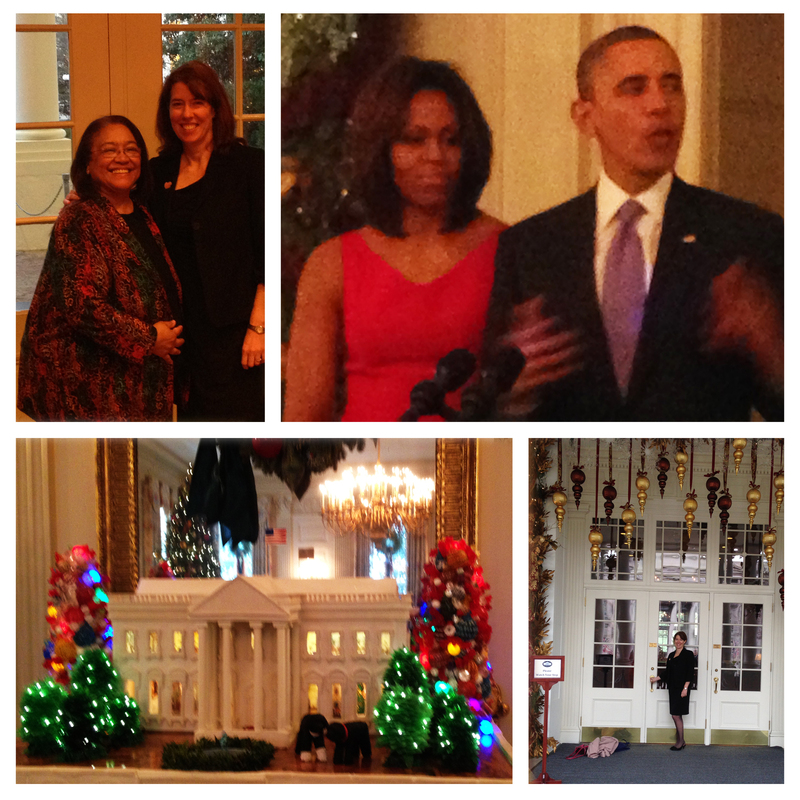 Invited by President Barack Obama and First Lady Michelle Obama, Co-Executive Directors Kristen Growney Yamamoto and Rita Shimmin were honored to represent GLIDE at a recent White House holiday reception on December 20. The rigor of the multiple security check points dissolved into displays of beautiful and magnificent decorations. Young men and women in formal military dress welcomed guests with smiles and holiday greetings. Loudly, proudly, and beautifully, a Baptist Ensemble sang a joyous salutation as we entered the room. Shaking hands with the President and the First Lady was the highlight of their visit. Their attendance also came with the privilege of wandering through several rooms where the history of our country is told in different ways. Every wall is decorated with photographs and paintings depicting presidents and first ladies, White House family traditions, dinner settings and holiday greetings from the beginning of our young country’s 200 years until the present. This year the White House, made of gingerbread, was displayed over a fireplace in one room. Up the stairs, the Marine Band Ensemble played holiday favorites, and champagne was offered in long stem glasses. Though the dress attire was conservative – black and subdued colors – the event was festive, everyone expressed joy and pleasure to be here – to be invited to the White House! History was everywhere. In addition to the holiday reception, Kristen and Rita were invited to a policy briefing by representatives from various offices of the President and First Lady. The invitees were a gathering of non-profit leaders from across the country. The President considers non-profits to be partners in implementing many of the initiatives of the White House and they left with an even deeper understanding that the work done at GLIDE is even bigger than what happens in the city, regionally, at the state level and even nationally. 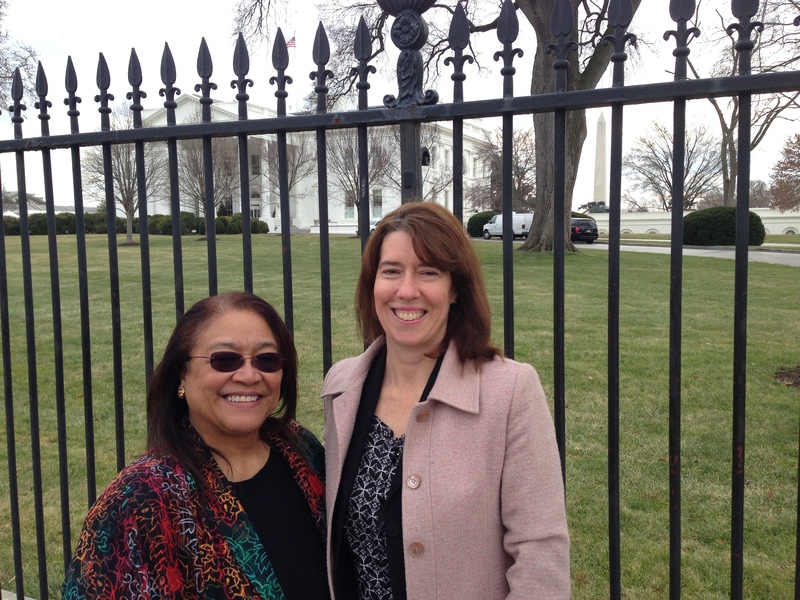 GLIDE’s work is important and an example of ‘walking the talk’ in Washington DC. GLIDE does the work every day. We are the President’s words, in action. Our selection and inclusion in the White House website as a ‘Champion Non-Profit’ highlights this for the world to see: http://www.whitehouse.gov/blog/2011/11/04/glide-champion-non-profit. Our country has many great leaders, evidenced by those in attendance at the party, by the history in the building, and our staff. In the morning policy update before the reception, there was a diverse group of non-profit leaders from across the country and across the spectrum of issues. They exemplified the leadership needed across our country and organizations to do our important work. GLIDE’s staff leaders are crucial to ‘walking the talk’ and creating examples for others to follow and share. Traditions are important. The opening of the White House to members of the public started with First Lady Martha Washington. Though it took three security checks plus a dog-sniffing check to get into the White House, the tradition continues to invite citizens to enjoy in-person time with our President. Kristen and Rita will carry these memories forward with them forever and as the New Year begins, they share best wishes in 2014!